Dumbbells are versatile and allow you to mimic many movements of exercise machines. Unlike a barbell, which you have to hold with both hands, dumbbells allow you to alternate your arms or work one arm at a time so you can really focus on the muscle you're targeting. Dumbbell exercises that are done while lying down mainly focus on your upper body, including the chest, back, triceps and shoulders. By lying on your back on an exercise bench, you can work your chest in many ways. You can do dumbbell pullovers by extending your arms overhead and holding the end of a dumbbell above your face. Bend your arms at the elbow to move the weight behind your head. Bench presses during which you press the weights up above your chest with an arch-like motion and flyes during which you lower the weights out to your sides before bringing them together above your chest are some other exercises. 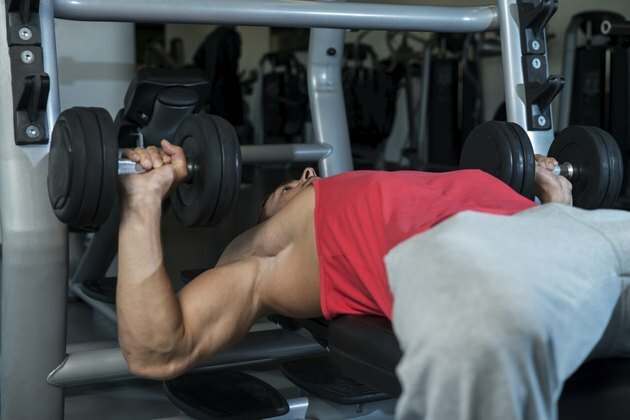 To target your chest from different angles, incline or decline the bench. You can strengthen your back by lying face down with your torso and pelvis on an exercise bench that's high enough so that when you extend your arms down, your hands don't touch the floor. Your legs shouldn't be on the bench. They should be extended behind you at a 45-degree angle so you can place your toes on the floor to stabilize your body. Hold a set of dumbbells in your arms with your palms facing each other. Then bend your elbows to raise the dumbbells up to your ribcage in a rowing motion. Squeeze your shoulder blades together at the top of the dumbbell row and then return the weights to the starting point. Although you may do tricep extensions while either standing upright or sitting down, you can also do them while lying on an exercise bench. While holding a set of dumbbells with your palms facing each other, extend your arms straight up to the ceiling above your shoulders. Then you bend your elbows and only move your forearms to bring the weights toward the sides of your head. When you return the weight to the starting point, really squeeze your triceps before starting the next repetition. There's no need to get up from the exercise bench to work your shoulders, just flip over on your stomach. This time, perform dumbbell rows, but instead of targeting your back by keeping your elbows at your sides, turn your palms so they face behind you and raise your elbows out at shoulder level until your arms form 90-degree angles. By straightening your arms while in the same position, you can do rear lateral raises. Simply raise extended arms out so your arms and body form a T-shape, and slowly return to the starting point. The Centers for Disease Control and Prevention suggest doing strength training at least two days a week. They recommend working your way up to finishing eight to 12 repetitions and two to three sets of each exercise. Always use enough weight so the last repetition of each set is difficult to finish without help. To see results, you always want to challenge your muscles. Consult a doctor before starting a workout routine, especially if injuries or medical conditions are at play. Does Weight Lifting Help Sagging Breasts? Can You Simulate Cable Crunches With Dumbbells? What Muscles Do Dumbbell Flyes Work?